Fast Blog Finder > Articles > Can NoFollow Links Hurt You? Can NoFollow Links Hurt You? Updated on April 5, 2012. Please, see the new information at the end of the article. I often get emails from Fast Blog Finder users who ask about the “NoFollow” blogs. Is it worth to comment on a blog if it’s "Nofollow"? Does it have any sense? Won't it hurt the website rankings?, etc. are the questions many of our users are concerned about. Well, I decided to do a case study to see if "NoFollow" links count and if it's worth our efforts to post comments on "NoFollow" blogs. But before I jump into the details of my case study, I'd like to share with you a good source where you can read about what a "NoFollow" tag is and why it's being practiced nowadays. So, if you are a newbie webmaster or blogger, go to this page http://en.wikipedia.org/wiki/Nofollow to read about the "NoFollow" attribute. And now let's go straight to the point. 2) posting comments on the "DoFollow" blogs only. 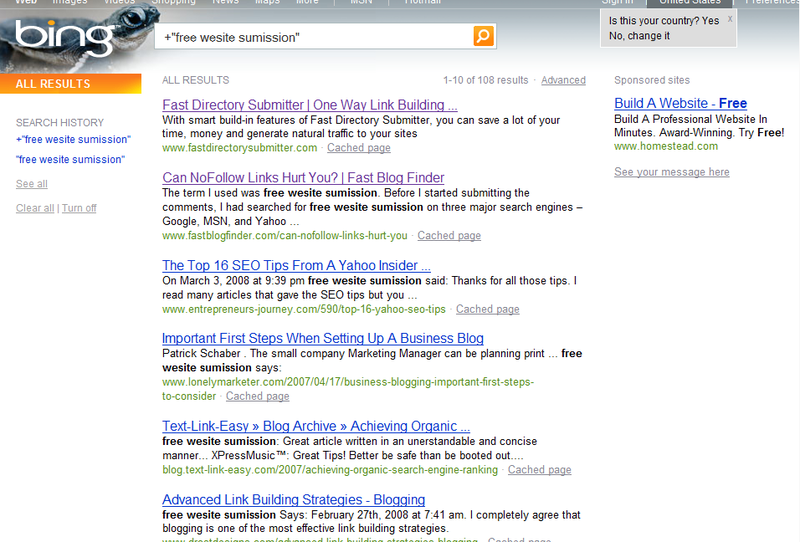 For my experiment I chose the www.fastdirectorysubmitter.com website dedicated to Fast Directory Submitter, another link building tool from G-Lock Software. This is a semi-automated tool that allows submitting a website to free web directories with varying titles and descriptions. I had a nice experience with this tool, by the way. I used it to submit the same site www.fastdirectorysubmitter.com to 2000+ directories and after 4 months the website PageRank raised from 0 to 4. I also thought about the keywords I would use as my name in comments and I chose a misspelling keyword phrase simply because 1) I was sure we didn't have inbound links with this anchor text, and 2) I’d be able to easily track the results that way. To search for blogs, I used our Fast Blog Finder software. For every submitted comment I wrote a note just to know if the comment was approved or awaiting moderation. The program automatically inserted the comment date that allowed me easily track my comments. To ensure that I submit the comments to the right blogs ("NoFollow" first and then "DoFollow") I switched the "Highlight NoFollow Links" option to On. This way I can clearly see the type of the links in comments. The term I used was free wesite sumission. Before I started submitting the comments, I had searched for free wesite sumission on three major search engines – Google, MSN, and Yahoo – to see if we were already listed there by those keywords. I found www.fastdirectorysubmitter.com at the 55th place in Google. MSN and Yahoo did not return our website for my search query. I ran a search for the blogs and selected only "NoFollow" ones. Finally, I got 18 approved comments on the "NoFollow" blogs with the PageRank from 3 to 6. A week later, I went to the search engines and entered my keywords free wesite sumission to see the results. I found www.fastdirectorysubmitter.com on the 55th place in Google (no change). Neither MSN nor Yahoo showed my site. Instead, in MSN and Yahoo I found the blogs where I had left comments. It means that the search engines indexed those blogs but my website did not show up in the search results. DO NOT improve your website position in search engine results. DO NOT hurt your website position in search engine results. Now you're probably wondering why spend time to submit comments to "NoFollow" blogs? The answer is simple – for human traffic. Always remember that you leave a comment for live persons. Thoughtful and interesting blog comments will always bring human visitors to your website who can then become your customers or subscribers. Has a search engine bot ever purchased anything from you? It's also important to note that "NoFollow" doesn't mean a link is bad in some way. The "NoFollow" tag will simply cause Google, MSN and Yahoo to ignore the link, to pretend it doesn't exist. Still another benefit: you shouldn't worry that people will link to you and use "NoFollow" as a way to hurt you. On March 3 I started submitting comments to "DoFollow" blogs using the same keywords – free wesite sumission – and the same website URL www.fastdirectorysubmitter.com. By March 19 I got 13 approved comments on "DoFollow" blogs with the PageRank from 0 to 5. The impact didn't take long to appear. 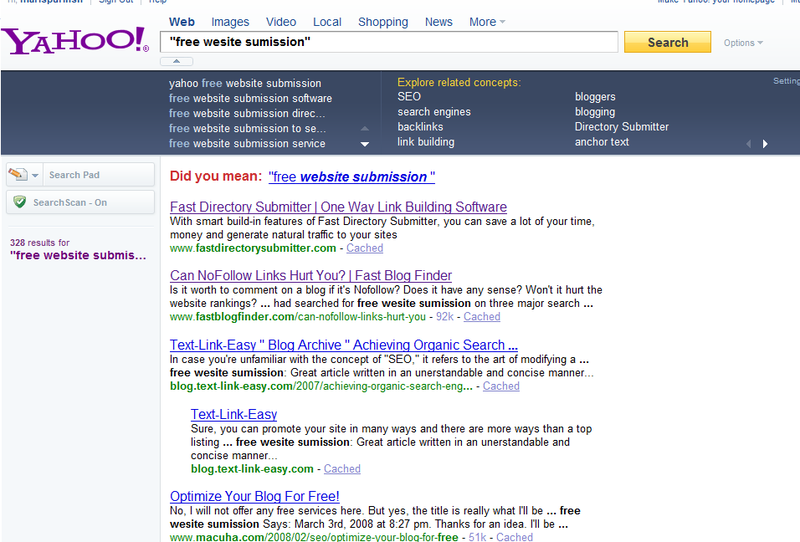 On March 4 (the next day after I started the submission to "DoFollow" blogs) my website was on the 1st position in Yahoo. Two weeks later – on March 18th – I found my website on the 1st place in MSN. 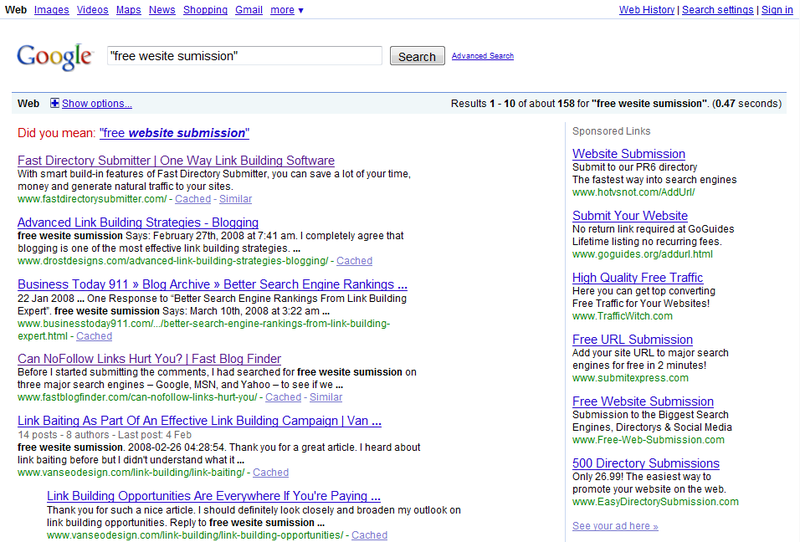 And at last on March 19th www.fastdirectorysubmitter.com showed up on the 2nd place in Google results. DO help a website get a higher position in search engines results. DO help get more human traffic and sales because having found your website on top positions people will likely click on your link. Unlike the links from "NoFollow" blogs that are completely ignored by Google, MSN and Yahoo, a link from a comment on a "DoFollow" blog is counted as a backlink. More quality backlinks a website has, higher its position in search engines. Comments on "NoFollow" blogs neither help nor hurt a website ranking in search engines but still they can bring some human traffic. "NoFollow" links do not affect a website search engine position. Comments on "DoFollow" blogs do help a website get top positions in search engines for target keywords => you get more website traffic and sales. Links from "DoFollow" blogs are counted as the "votes" for a website ranking. One more important point: on my opinion, you should tend to natural blog linking that means commenting on "DoFollow" blogs as well as on "NoFollow" blogs with higher PR. If you submit comments to "DoFollow" blogs only, your link building strategy is not following natural ways, and could be considered as anchor text and linking manipulation. Also be selective with the anchor text. Along with your keywords you can use your name or nickname to show that you comment because you have something to say and not because you want to solicit a backlink. You can limit your non-relevant anchors to 15% of your comments and use them on low authority blogs. On big sites, go for the big prize and enter your targeted keyword anchor text. And that's not all… As my case study shows blog commenting can help you get your website to rank well for misspelled keywords. People are often in a hurry and can type the keywords with mistakes. So, what do they get in the results? There is a great chance for your URL to be on the 1st position and a great opportunity for you to get new customers. As you see, blog commenting is one of the most effective and easiest link building strategies along with article submission and directory submission. Applying the combination of these tools you can get an outstanding result in your website promotion. Read how the Gold version of Fast Blog Finder differs from the Free version and start searching for "DoFollow" blogs right now. Well, it has been more than 2 years since I made this case study. Today I'm curious if my site www.fastdirectorysubmitter.com is still on the top positions in search engines for my test keywords "free wesite sumission". I did a search and here is what I found. Please, see the screenshots below. www.fastdirectorysubmitter.com is on the 1st place in all search engines used for the case study – Google, Yahoo and Bing (former MSN). I often hear people saying on forums that links from blog comments are no longer valued by search engines so we should not waste our time for blog commenting. But as you can see yourself our website still takes the top position in search engines after 2 years. So, we can conclude that DoFollow links from blog comments are still valued and contribute to the website ranking. I chose the misspelled phrase "free wesite sumission" for my case study to be able to easily search for it at a later time because we don't have competitors for this phrase. Note that I did not use any other link building methods except blog commenting to build links for "free wesite sumission" keywords during and after the case study. So, the links obtained from comments during the case study were the only ones counted by search engines. Of course, if you want to rank for popular keywords, you need to build links continuously and use various link building methods such as blog commenting, directory submission, press releases etc. BTW. Are you still using the free version of Fast Blog Finder? Learn what the Gold version can do for you here. Shady Link Building Methods You Should Avoid.